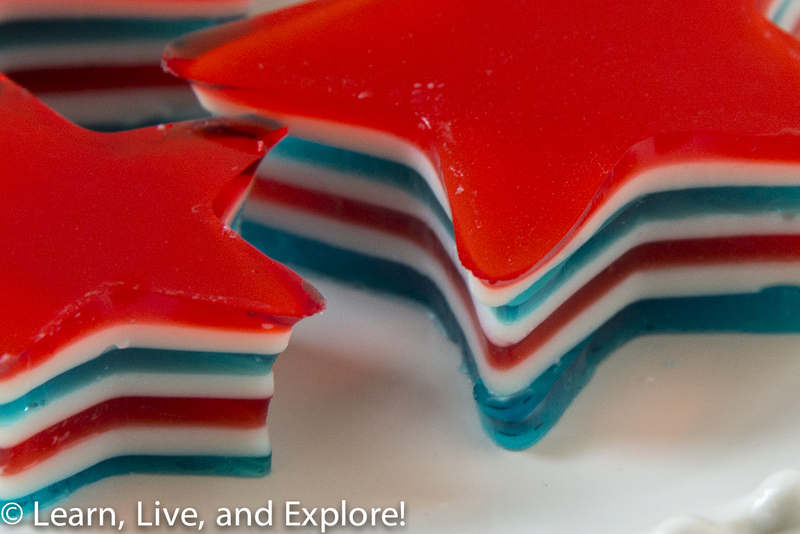 4th of July Jello Stars ~ Learn, Live, and Explore! It's that time of year to roll out the patriotic themed desserts. I have two I chose for the 4th of July this year. First up, layered jello stars! These finger gigglers are blue raspberry, strawberry, and cream flavored. They take a little time for each layer to set up in the refrigerator, but the actual effort to make them is not so bad. 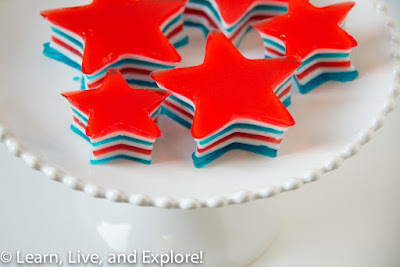 There are a lot of jello stars out there for inspiration, but I chose the ones from Lynne at 365 Days of Baking and More. I'm not even going to copy her recipe here because I followed it to the letter and especially appreciated her insightful tips. It had been years since I worked with jello, and the detailed instructions were a great learning tool. So, I encourage you to follow the link if you are interested. From my own experience, make sure you give the layers plenty of time to set up and do your best to remove bubbles. This is probably going to take up to 3 hours for you to make, and while you can take breaks between the layers, remember that the condensed milk waiting at room temperature to be poured will start to solidify. I actually had a little bit of that happen to me and found success putting the bowl in the microwave for 10 seconds, stirring to see if it's the correct consistency, and repeating of it is not.